centers. These horizontal forces cause rock and water to feel a gravitational force which results in the flow of rock and water into the 'tidal bulges'. There will be exactly two of these bulges (Cooley, 2002). So, if the moon was above the East, it and West would be experiencing high tide while North and South would low tide. Singapore has two low tides and two high tides every day. However, these tides are inconsistent as their level and timings changes everyday. Each high tide and low tide lasts for a certain time, about 6 ¼ hours (tides4fishing, 2014) before slowly receding or incoming. When intertidal zone creatures are captured and put in tanks, it is difficult for them to adapt to their new surroundings and this majorly decreases their lifespan as their health dwindles. Their habits and behavioural practices may also differ from in the natural habitat. This can prove to be an obstruction during experiments and researches conducted in labs and marine life parks. Lifespan: On a smaller scale, when sea creatures, like crabs, are kept in captivity in restaurants, it is a necessity to kill them as they cannot survive in store. With a tide simulator, where tides are brought into the meager tanks, intertidal zone creatures will be able to survive for much longer in a healthy state as well. The Circatidal Cycle - To match tide cycles, many marine organisms, like mussels, have developed biological tidal rhythms, known as circatidal cycles, that impact daily patterns of behavior and physiology ( M. Connor & Y. Gracey). Intertidal marine invertebrates usually synchronize their mating, spawning or larval hatching with spring tides to maximize reproductive success. Disrupting the tidal cycles might also change their metabolism, how well they are able to process food, particularly when the availability of certain food can be tied to how other organisms' behaviors are timed. ("How would tide-affected life forms function if transported to space?") This is shown in a research conducted to conclude that disruption of endogenous tidal rhythms of larval release lead to food supply and heat stress in an intertidal barnacle (Kasten, Flores). Singapore has two low tides and two high tides every day. However, these tides are inconsistent as their level and timings changes everyday (Tan, 2009). Each high tide and low tide lasts for a certain time before slowly receding or incoming (tides4fishing, 2014). Our goal is to simulate these sea patterns and timings under a controlled environment, which would be the set-up of the tanks. The tide simulator to follow the sea tide pattern. Average of 6 and one quarter interval between each tide. This is the pattern that will be followed in the set up. According to the diagram, two similar metal weights are hung on a pulley, which is connected to a motor. Programmed with an arduino, the motor would be programmed to spin clockwise and then anticlockwise, at regular intervals thus, spinning the pulley as well. This would allow the weights on either side to rise and fall. Once water is added into the tank, the rise and fall of height of the weight in the tank and the rise and fall in water level would be inversely proportionate. So, when the weight sinks into the tank, the water level would rise due to the extra volume inserted (high tide) and when the weight is brought back up, the water level will fall again as the extra volume is removed (low tide). This process will be repeated in a cycle. Simulating the rising and falling of tides. The setting up is simple and the data collected will give a nice, smooth curve when plotted on graph as the water will rise and fall would be very smooth due to the fact that we could programme the motor. The entire set-up is too big and bulky with two metal weights at the side and a tank. It would not be convenient when it comes to keeping in a restaurant or even a house. Two tanks would be positioned beside each other and a pump would be going from either tank into the other, as shown above. So, water from Tank A can flow to tank B and the other way round too. Firstly, one of the pumps will start and water from that tank A will flow into Tank B, causing a low tide in A. Then, the pump will be stopped and the pump in Tank B will start so now, water will flow from Tank B back to A, causing high tide in Tank A. The pumps will be programmed by Arduino on a relay circuit so they will start and stop at certain intervals.This process will repeated in a cycle. Setting this up is simple and the coding on arduino will also be relatively easy. Also, the set up will be easy to control and the flow of water will be gradual, thus the data will result in a smooth curve on the graph. The tanks are placed on the same level, thus gravity will not come into play. So, more energy will be required to feed two pumps to allow flow to and fro both tanks. Thus the monetary value used to run this machinery would be very costly, especially the price of electricity. From another point of view, the use of electricity would also result in global warming due to the generation of electricity. As from the diagram, the tanks are arranged in a way that, one is higher than the other; this would play on the gravity of the earth. A pipe is connected from the higher tank to the lower tank. This would allow water to flow down at a constant rate due to gravity. There will be a pump in the lower tank, so water can also flow from the lower tank to the upper tank as well. However, the pump will be pumping water at a faster rate than water flows through the pipe due to gravity. Firstly, the pump will be started, so water will flow into the upper tank faster than it flows out of it, creating high tide. Then after a some time, the pump will stop and water will only be flowing out of the upper tank, causing a low tide in it. This process will repeated in a cycle. Gravity will come into play in one way of water flow, so energy will only be required to start up one pump. Coding the arduino here will be simple as it is only for one pump because the flow from higher tank will be by gravity and constant. The drop in water level during high tide will be quite sharp, unlike the actual sea tide pattern. Thus, the graph plotted will not be a smooth curve. Calibration to make sure the flow of water is constant, and accurate will also be needed, which will prove to be difficult. This method works by arranging two tanks, one above the other. A bell siphon will be placed at the bottom on the upper tank, leading to the lower tank so water from the upper tank can be drained into the lower tank. The bell syphon works by allowing water to collect in the tank until the water level is above the bell and then begins draining out the water in the tank (Japan A.). Firstly, the pump will start pumping water from the lower tank into the upper tank, causing a low tide in the lower tank. Then, once the water level in the upper tank hits the bell siphon level, the pump will stop and the siphon will begin draining out the water from the upper tank into the lower tank, creating high tide in the lower tank. This process will be repeated in a cycle. The set up is very easy with the addition bell siphon and setting the two tanks at different heights. The pump would pump water from the lower tank from the higher tank while the siphon would drain out the water from the higher tank into the lower one. The decrease in water in the tank would be too abrupt, leaving a saw tooth pattern if the data were plotted on a graph, whereas a sine graph is needed. There are two tanks, A and B. A pump in tank B will be leading to tank A, allowing water flow from B to A. There will also be two arduino-based water sensors, one at the maximum water level (high tide) and one at the minimum water level (low tide). The two pipes will be connected by a claber male threaded two-way tap connector, which allows water to flow both either way by turning an internal ‘dam’. The pump, tap and water sensors will be connected to one arduino board. The water level in tank B will be touching the first water sensor and because of this Arduino will trigger the Stepper motor to turn, stopping flow of water through the tap and then start up the pump. Water will now flow from Tank B to A, creating a high tide in Tank A. Once the water level in Tank B drops to the lower water sensor, Arduino will trigger the stop of the pump and the turn of the stepper motor, allowing the flow of water from Tank A to B. Now, water will flow out from Tank A into Tank B, creating low tide in Tank A. Once the water level in Tank B reaches the higher sensor again, the process will be repeated in a cycle. The increase and decrease in the water level in the tank will be gradual and slow. This will result in smooth graph when the results are plotted. We will need to program arduino to control four appliances. The sensors, measuring the water level, will trigger a reaction in the arduino to turn on the tap and the pump at certain intervals. This will definitely prove to be a challenge to code as this set up is quite high tech. The best solution is solution 5. This is an innovative solution that will allow us to learn extensively. The disadvantage of not being able to program arduino can be overcome easily as we can pick up the relevant skills. This is unlike the disadvantages of the rest of the solutions that will not be as easy to solve because they require us to change an entire element of the design. Once the disadvantage is overcome, the advantage will greatly benefit us and help us achieve our desired results. After looking at the diagram again, we realized that the positioning of the sensors would result in a more complicated code in Arduino and the whole project is majorly dependent on Arduino. Thus, to simplify it, we decided to rearrange the sensors, such that there is one in each tank, so the water will not be touching two at the same time. Also, instead of a Tap connector, we will be using another pump, so there will be one pump in each tank. 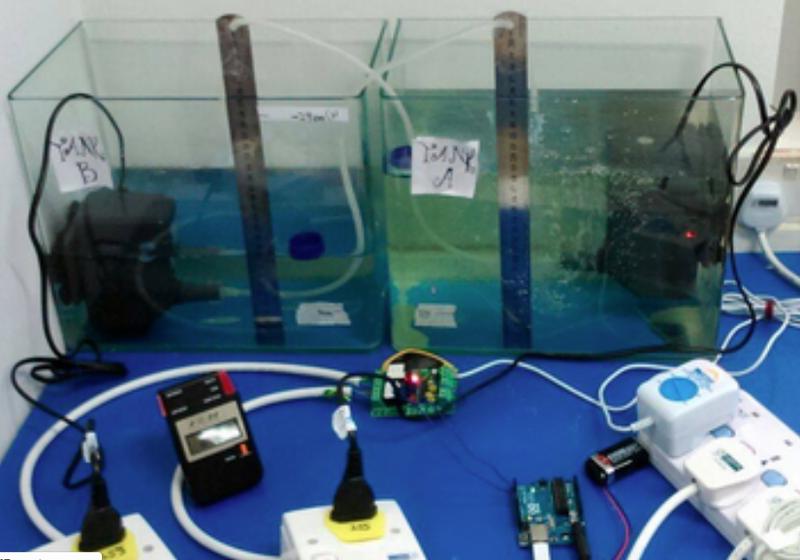 The arduino-based water sensor is used to detect when the water has reached a certain level. It has three parts: An Electronic brick connector, a 1 MΩ resistor and several lines of bare conducting wires. The circuit in the water sensor will work with the arduino to detect the amount of water that has been in contact. It also has low power consumption and high sensitivity, allowing it to be highly efficient in aiding with the project. The water sensor can judge the water level through a series of exposed parallel wires stitch to measure the water droplet/size. We will be constructing a water sensor with a similar concept. The important idea is that salt water conducts electricity. So, we will be connecting a wire to each end of a battery without connecting the two wires together. This will result in an open circuit and when water closes the gap, the circuit will close, causing electricity to flow through. This clearly indicates that water has reached the circuit, and thus the level needed. When the lower sensor detects water, it would instruct Arduino to stop the pump, start the stepper motor, which would turn the tap connector, allowing water to flow through to the other tank. Once the water reaches the higher water sensor, it will instruct Arduino to close the stepper motor, turning the tap connector again, so water cannot flow through to the tank, and start the pump. The cycle will repeat as the water level would keep hitting the sensors alternatively. This saves a lot of human effort as we do not need to be there to manually switch on or off the pump and stepper motor.